Reserve Bear'ly Makin' It Today! Cabin was great! Slept 6 of us comfortably. Only issues were keeping the downstairs and upstairs both confortable temperatures, and the shower downstairs was way too small. The shower heads downstairs were frustrating to work and would spray out all over the floor when you turned the shower on. Our family of 4 loved this place! I would definitely like to stay here again. It was clean, warm, cozy and relaxing. The kids enjoyed the upstairs game/theater room! I loved that the kitchen was fully equipped and we enjoyed a morning breakfast by the fire before heading out to Pigeon Forge. We had an issue with the TV when we got there but someone came and fixed it in no time. The cabin is located about 10 minutes from town, which I thought was just far enough away but still close. I hated to leave but can't wait to come back! Beautiful cabin with great amenities! Private but the view is just ok. Had everything things we needed it was just like we were at home. Thanks for plenty of towels and blankets( important with 3 kids who loved the hot tub)! The theater/ game room was my favorite part of this cabin! This cabin was very nice, clean, lots of extras. Really enjoyed our stay and will use again in the future. Cabin is exactly as pictured. Had everything you need incliding a keurig for morning coffee 😀. There is cabins around this one but with the woods there u still hv plenty of privacy. 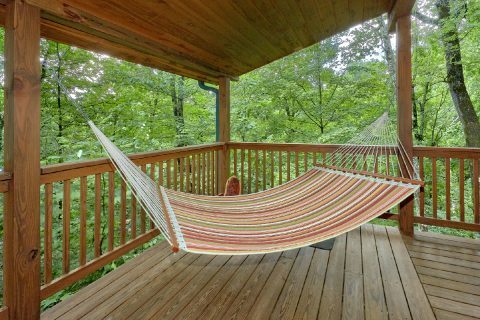 Good location only about 15 mins from pigeon forge or 20 from gatlinburg. We will def stay again! Excellent location... very close to all things we wanted to see and do.... kids loved the hammock and of course the loft and arcade game !!!! The “road” leading to cabin was a little scary for my city family.